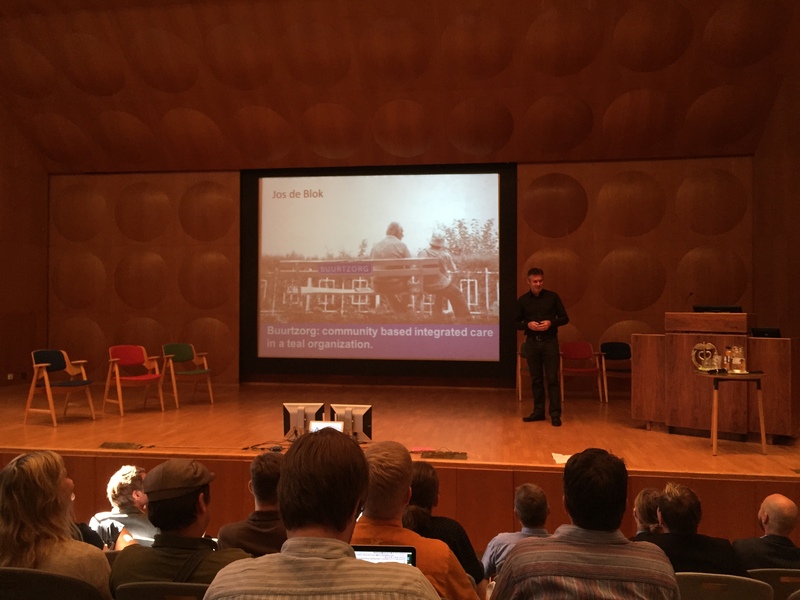 I participated to the Future of Work seminar which was held this month at Hanken International Business School in Helsinki. It is time for new solutions says Buurtzorg`s establisher Jos de Blok. Keeping old working models and trying to improve efficiency has come to the end. Why Buurtzorg? Jos de Blok had a long history working as a district nurse and before that he studied few years economics. He noticed with few co-workers that they were too concentrated to different products instead of patients. Patient satisfaction went down. Many products, divided to activities, needed specialists. There where too many caregivers treating same patient. The most important thing, patient`s and nurse`s relationship could not be built. Patients and nurses got frustrated. At the same time costs went up as more specialists were needed, also schedule planners and different coordinators were needed to keep processes efficient. The middle management was growing because of the complexity. Professional nurses frustrated even more as they could not plan they own work anymore. Nurses wanted to do their job as good as possible, but the system was actually against that will. The purpose must have been good in those health care companies, but still things went worse. Nurse job was not inspiring as you could not give your own input by influencing how the job should be done. I think that applies for other industries also. Management is lacking trust and thinking control is the answer to lead people. But control is not driving intrinsic motivation that leads to passion and totally different work spirit and productiveness. 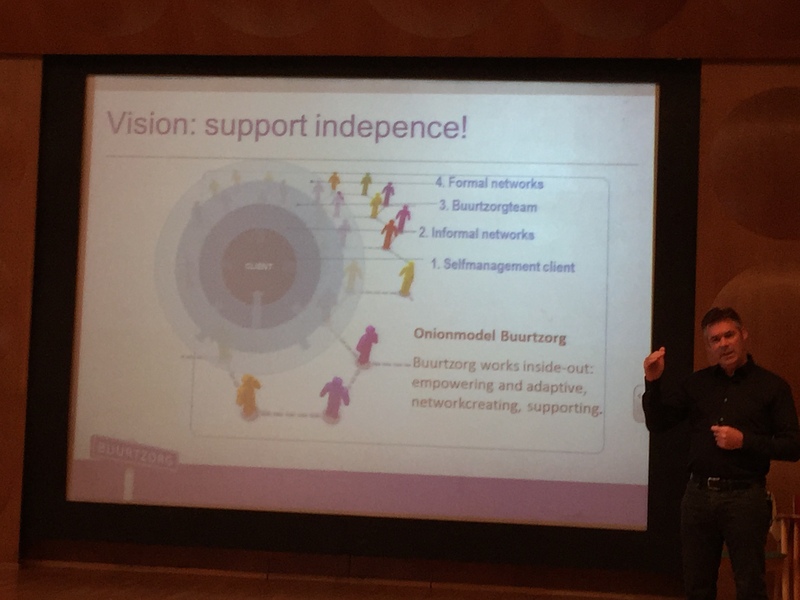 Buurtzorg started 2007 with one team and has grown since that to 800 independed self-directed teams without managers. All employees are trusted and respected professionals. One team consists of max 12 nurses. Teams organize and are responsible for the entire process. Most of the nurses are generalists, so it is easy for the teams to plan themselves nursing/medical and social care. There are no products client needs to buy separately. The care is planned with the client. Nurses are concentrating to the client in a holistic way meaning to the patient`s illness and empathy needs and how to support her/him and help possible family members/volunteers to understand patient situation and how they can help. Patient needs to feel secure, so trust is important. Client satisfaction results have been excellent. Nurses are motivated as they can plan how they treat different patients and how long it takes. They are in control of they own work and may built meaningful relationships with their clients. Cost structure is lower from average as middle management is not needed. There is more money left for the care itself and for innovation. Nurses, that do the job, are fairly paid. I see this as a win-win-win formula. Teams have support they need. Teams may hire coach if they need help in cases they cannot solve themselves. At the moment there is 15 coaches available. The back office consists of 45 people which pay salaries to nurses and take care of the invoicing of the clients. There is not any schedule planners or other middle level managers. Teams take care of planning the work, hiring the nurses, the education and also the finance of the team. Everything is in ICT system, which has been made with the nurses. Simply and transparent system is easy to use and always with you. Production is not monitored, but outcome is by team members themselves. Different teams share they thoughts, innovation ideas and problems in a common web-community which is also an e-learning environment. Best ideas spread naturally. Teams feel they are autonomous, but still part of Buurtzorg and sharing the same values. Buurtzorg is great example of organisation which has succeeded without managers and bureaucracy. Of course it is much easier when you start from the scratch. The organisation do not have old habits, procedures and hierarchic structure that may prevent the change to happen. Working in Buurtzorg you get lot of freedom, but also responsibility. Nurses that are proactive, willing to improve themselves and always open for new ways of doing things are more suitable for self-directed teams than those that want somebody else to say what they need to do and just do the job they are told. So Buurtzorg does not suite for everybody. If you are interested for new ways of organizing work take a look e.g. Fredric Laloux’s book Reinventing Organizations and Dr. Sharda Nandram`s , who studied deeply Buurtzorg organization, book called Organizational Innovation by Integrating Simplification. If there is a will, there is a chance to make it happen.